Monday night, my group had our last regular session of D&D. There is some hope that we will be able to continue playing with one player participating via video chat; for the most part, though, I think we are done, for a few months at least. I’m still saddened that this is true, but not quite as despondent as I was a week ago. One reason why I am feeling better is because the last session went very, very well. I was quite nervous, far more so than normal, as the night began. Given how much cool stuff we had done so far, I really felt like I needed to pull out all the stops for the grand finale. I was unsure if what I had prepared was sufficient. Here’s what I learned from running what might be this group’s last D&D game. There were several dangling plot points from our previous six levels of adventure. Some were rather minor. Others were more worthy of exploring further. One rather mundane plot point was leftover from the previous session, where the PCs found missing miners who had been petrified by a group of cockatrices. They had the feathers that could now be used to brew a potion to revive the miners. This felt a bit boring to me, so I decided to have a friendly NPC wizard (Ravide the Black from the Cairn of the Winter King) brew it for them, “off camera”. No sense wasting much game time with this when there were better things to do. On the other hand, the PCs had discovered a long-forgotten secret passage underneath their home base, the Tower of Waiting in Fallcrest. I had been leaving little tidbits here and there that the passage might lead to the ancient (and supposedly empty) dragon’s lair under the Nentir Falls. Investigating this seemed far more exciting than brewing a potion for a week, so that’s the direction I went. To help spur the PCs to check out the passage, I set the stage with a nice NPC interaction: the Lord Warden and Armos Kamroth, a slum lord, had an argument over who really owned the Tower of Waiting. This led to a fantastic role-playing moment. The players really got into character, and by the end of it, they were extremely suspicious of that slimeball Armos. Mission accompolished! It’s important to prioritize your play time. Even the most regular campaigns typically involve a handful of hours each week; getting bogged down in minutiae or chasing boring plot threads isn’t fun for anyone. Abandon what isn’t working, and focus on exciting battles, skill challenges, and role-playing opportunities. 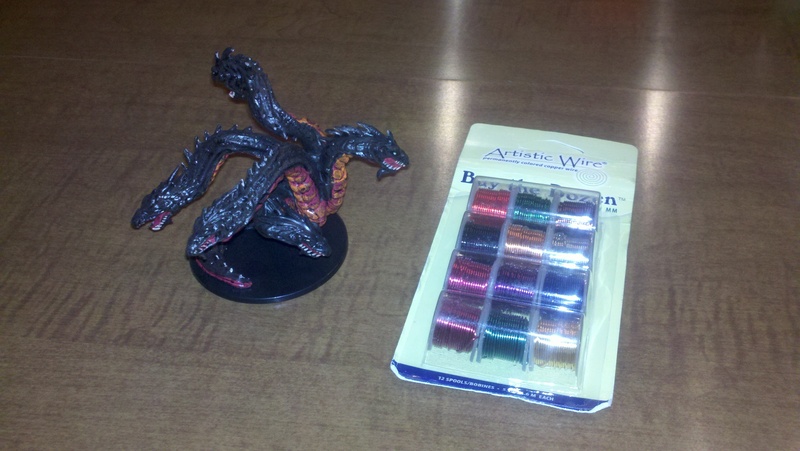 A couple months ago, the D&D group all pitched in and bought Gaming Paper’s Mega-Dungeon pack. This product is 100 letter-sized maps that can be combined in all sorts of different ways. The sheets are double sided, one with empty rooms and the other furnished. 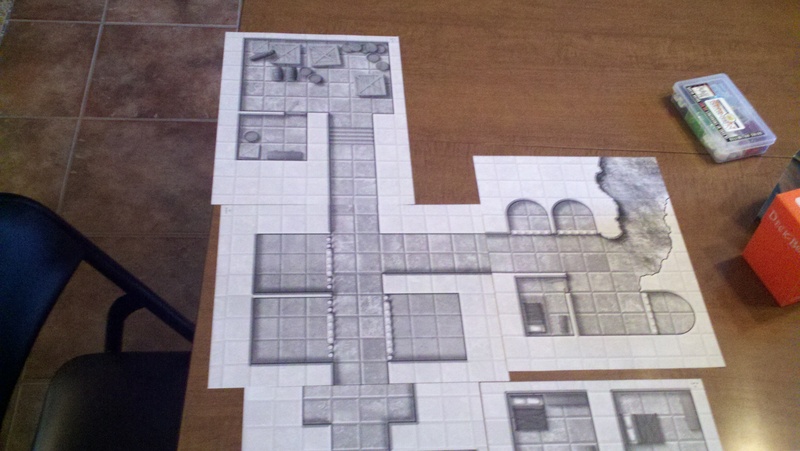 I had planned to use them as a giant super-dungeon that would be explored for several levels of play. With one session left, this was impossible. However, due to the modular nature of the maps sheets, I was able to throw together a nice prison cell/guard barracks layout, which made sense to be at the bottom of the tower’s secret passage. There was even a room that had a natural tunnel on one end, which was a perfect way to tie it to the cavernous dragon’s lair. It all fit together very nicely, without a lot of prep time digging through dungeon tile boxes or messing with sticky-tac. I was quite pleased with the Gaming Paper Mega-Dungeon. It is convenient, very professional in appearance, and is reasonably priced. I hope to do a more extensive review of this product in the future. I knew I wanted something really impressive for the last battle of the evening. The groundwork had been laid that there was something unusual in the caverns beneath Fallcrest, and I knew this was the time to finally reveal what it was: a secret temple devoted to Tiamat! I knew they wouldn’t have time to get into the temple, only to find it, during this one session. It was an interesting challenge: how could I have a great fight with something that was in the earliest areas of the temple? I decided to put a guardian outside the temple instead, leaving the exploration of the new dungeon for a later time. (Maybe a cliffhanger would make them want to play again that much sooner, right?) Anyway, I left a few clues that an encounter with a dragon was coming up, then, when at last the guardian of the temple was revealed, I switched it up and used a five-headed hydra. I had gotten extremely lucky opening a Lords of Madness pack blindly, and got the really impressive Heroslayer Hydra mini. It had five heads, which made it an ideal pet devoted to the queen of all evil dragons. But I decided to go one step further, and used a rather interesting prop along with the mini. I used craft wire (which I had purchased to make area of effect markers with) to distinguish each of the heads. I wrapped each head in a spiral pattern, in the five colors corresponding to Tiamat’s heads. The effect was better than I had hoped, and when the mini hit the table, my players were very impressed. I explained the wires as strange metal harnesses bolted into the flesh of the hydra, emanating magic, likely used to control the savage beast. I used the 10th level hydra from the Monster Vault, levelled down to 8, to seriously challenge my 7th level party. Since I was using a five headed beast rather than the standard four, I took away one of its action points and also the damage bonus as heads were destroyed to compensate. The battle was tough, very strategic, and, as a result, highly memorable. When it’s time to wrap up a campaign, or even a single adventure, it’s essential to make the ending as good as you possibly can. I could have just used a dragon, or the unmodified hydra, but the craft wire looked cool, tied into the setting, and made the whole encounter special. If this does indeed turn out to be our last session, I am very satisfied with how it went.